Launched this week by Desert River Games, Safari Challenge is an example of the sort of Facebook games I admire the most, one that harnesses the actions of gamers sitting at computers in their comfortable homes to create a living charity engine. I feel much better building a virtual village when I know my lazy clicking could help feed hungry children in Africa or build them a playground. Like Sojo Studios' WeTopia and Joy Kingdom, Desert River's Safari Challenge has players performing the usual social gaming tasks in order to generate a virtual currency (here called 'Impact') that can be invested in various charity programs. So far I've invested the 50 points I've earned in the "Meals for Kids". Those points will translate into money the Kids Around the World charity will use to bring healthy meals to African orphans. Players can also purchase virtual goods with real currency, a portion of the proceeds (after Facebook's 30 percent cut and operating costs) going towards their charity of choice. According to a profile on the game and developer at Fox News, the impetus for Safari Challenge came to Desert River Games founder and CEO Jacob Bonnema following a 2006 trip to Africa with his wife Kelly, during which the couple adopted their daughter Covey, short for Covenant. Fueled by the urge to give back, Desert River Games was born, driven by the mantra "gaming is giving." 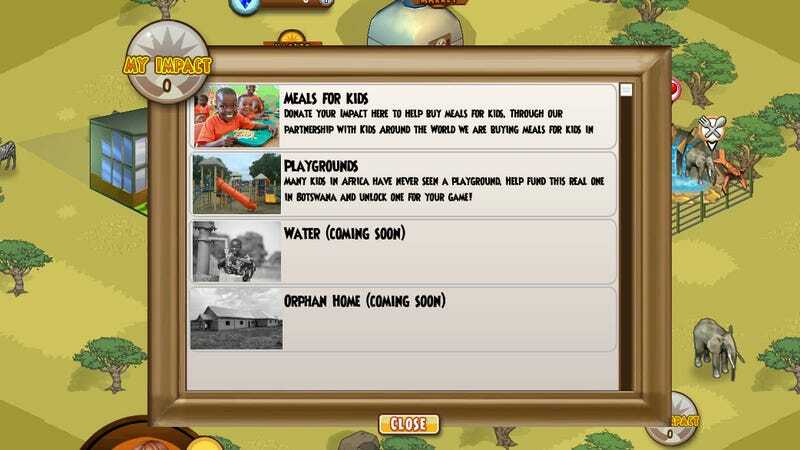 The game has players building their own safari village, creating dwellings, stores and animal habitats. In a twist on the traditional 2D town builder, the game also features a fully 3D safari component as well, allowing players to explore and take pictures of polygons shaped and painted to resemble African wildlife. I'd show you a picture of the 3D element, but I can't seem to get it to work. Safari Challenge is a bit buggy at the moment, which isn't unexpected from the beta of the first game from a brand new developer. I'm sure they'll get the kinks ironed out shortly. I'm not going to let a few glitches get in the way of making my errant clicks count for something.